Josh Cohen is the founder and CEO of Junkluggers. 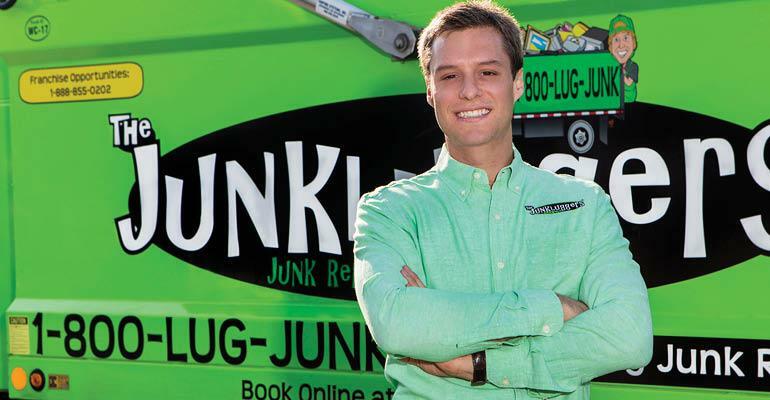 He founded Junkluggers out of his mom's Dodge Durango 14 years ago and has grown the company into one of the largest junk removal franchises in the country. For Josh, it's about much more than just hauling junk away. He has a greater mission guiding everything they do. Their B.H.A.G. is to ensure no junk collected by Junkluggers enters a landfill by 2025. They are completing the process now to convert their corporation into a b-corp meaning that while they do strive for profits, they're also driven by and held accountable to bettering the world. What careers did you explore before junk removal? Josh: I wanted to be either a cowboy or a real estate investor when I grew up, but I missed it by a long shot: I became the CEO of an eco-friendly junk removal company instead. It started as a summer job. I passed out flyers and hauled SUVs full of junk for $30 a pop. But I continued to do it on the side after I graduated college. I went to school for real estate and economics and planned on being a real estate mogul after graduation, but I saw a lot of potential in my existing business. I wanted to “bleed green,” even if it meant giving up a better-paying job to follow my dreams. My dad initially discouraged this but had a change of heart after seeing my passion for my mission. I realized early on that professional, sustainable junk removal wasn’t unique to the New York tri-state area. It was something everyone in the country could benefit from, so I took the idea and ran with it. What inspired you to start Junkluggers out of your mom’s Dodge Durango? Josh: It was really something that I created on a whim while studying abroad in Australia. Someone casually mentioned that they moved a refrigerator for their neighbor for a hundred bucks. If I could expand on this idea, I thought it would be the perfect business opportunity for me as a college student. This was the first iteration of The Junkluggers. This idea also aligned with a lot of personal values. I always believed in saving the environment. My parents always remind me that I was the annoying recycler growing up. I also spent a lot of time outdoors instead of watching TV. I developed a love for hiking and protecting nature. Sustainable junk removal lets me work to save the environment on a larger scale. I'm also empathetic by nature, and I realized this trait was missing in the junk removal industry. Customers don’t just want someone to haul away their junk. They wanted someone to connect with and to care about the process. I knew my junk removal service could fill this void. I believe that empathy relates to a company's success. It puts a face to a brand and creates a connection with the customer. What did you notice customers were looking for in a junk removal service? It must also be an empathetic business. Customers can feel uncomfortable and disconnected during the junk removal process. After all, strangers are taking away their memories and sentimental items without a second thought. Customers want a connection and to know that someone cares. I identified this as something that could set me apart from the competition. How did you connect the dots between junk removal and profit? Josh: Upon hearing my friend’s refrigerator story, I realized hauling junk could be a profitable career. I initially charged $30 a carload, which was a total steal. It also ruined my mom’s SUV, which I was using as my first junk hauling “truck” — I blew the car’s transmission. And in a short time, the junk removal jobs kept coming in. I immediately saw the value in offering customers a service that was professional, reliable, and sustainable. Now the average junk haul is from $120 to $650. I realized early on that this wasn’t a business dependent on a specific area or a certain type of customer. Everyone across the country could benefit from sustainable junk removal, but it would take a lot of time and effort to get us there. That’s when I got interested in franchising the business to help us grow and profit. We now have 23 franchises across the US. Walk us through what you plan to accomplish with your Big Hairy Audacious Goal (BHAG). Josh: I picked up Jim Collin’s book Good to Great and learned how great companies were upending their respective industries. Their victories were inspiring to me. Their successes made me realize that I needed to motivate my team and my company if I also wanted The Junkluggers to grow. I realized a BHAG would be the best way to make this happen. Our BHAG is to keep all the reusable “junk” we pick up out of landfills by 2025. This seemingly impossible goal is in line with our company vision to enhance lives, communities, and the environment by donating, recycling, upcycling and supporting local charities. - Completely eliminate cardboard and metals from ending up in the landfill. We are presently about 80 percent of the way there. - Find more opportunities for recycling and repurposing children’s toys and games. - Uncover additional ways to reuse/recycle/donate more couches and sofas. Our BHAG helps us defy all the possibilities and overcome industry constraints. Why is a BHAG mission critical for a company’s success? - It motivates everyone. With a big end goal in sight, everyone knows what part their actions play in achieving it. Everyone is more accountable and motivated to do their part. - It creates camaraderie. To tackle this specific company-wide goal requires all hands on deck. This fosters better communication and more collaboration between departments. - It lets you tackle a social issue. When you tie your BHAG to something greater than the company, employees and customers are more likely to support it. Employees see greater value in their work if their company solves a social issue. Customers also feel better when they know their support directly impacts something bigger. What are three things an entrepreneur needs to know before creating a meaningful BHAG? Josh: Let me start off by staying that BHAGs are a little crazy, but that’s the whole point. They need to be a little outlandish to get the conversation started. A crazy goal will motivate people to think bigger than any short-term goal ever could. - Commit to it. Once you create your BHAG, don’t back down no matter what anyone says. This dedication to your BHAG will inspire your employees to adopt the same passion. - Make it stick. Your BHAG will be your company’s new North Star. Make sure you talk about it in meetings, put it on signage in your office, and incorporate it into your web copy. The more people see it, the more your BHAG will stay top of mind. - Tie it to a social purpose. A BHAG must be clear, time-constrained, and measurable. But I’ve found one more thing that makes a BHAG meaningful: tying it to a greater cause. Employees are more invested when their work affects an issue that is larger than the company. What factors make for a low-quality BHAG? - It’s not specific. When you have a vague BHAG, success is open to interpretation. Make it specific so everyone knows exactly what the end goal is. - It’s not time-constrained. The typical BHAG will have a timeframe of five to 30 years. - It’s too easy. If you’ve achieved your BHAG already, chances are it was way too easy. Don’t forget the “audacious” part when creating your BHAG. It will be the driving force behind your company. - It’s not tied to a social purpose. Relating your BHAG to a social purpose helps build your company’s brand. This social purpose will align your brand with a bigger cause. It will also motivate employees and show that their work influences something greater.